O.F. Mossberg & Sons slipped into the AR-15 platform market largely under the radar last summer when they unveiled their Mossberg Modern Rifle (MMR) line of rifles alongside their line of MVP bolt-action varmint rifles which accept AR-15 magazines. It is clear that Mossberg sees the obvious and growing interest in this platform, but with the current near-saturation of the AR market, both for complete rifles as well as aftermarket accessories, it may be a tough market for a new player to break in to. The veteran hunting rifle and shotgun manufacturer needs to bring a lot to the table. Zumbo recanted his anti- “black rifle” sentiments (in which he referred to AK47 and AR15 style rifles by the misnomer “assault rifles” before going on to say “I’ll go so far as to call them ‘terrorist’ rifles”) after hitting the range with Ted Nugent and experiencing them for himself. Perhaps seeing these rifles, traditionally seen as military or police weapons, get the nod from a trusted hunting buddy like Mossberg will tug at hunters’ heartstrings and bring about some new-found endearment for this “modern” platform. 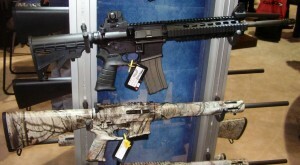 GunLink had a chance to handle several of the 11 available MMR models at the 2012 SHOT Show. As far as the rifle itself goes, for the most part, it looks like…well, an AR-15. Despite growing popularity of piston operated AR-15 style rifles, Mossberg has opted to go with the same tried and mostly-true direct impingement gas operated system which has been a part of Eugene Stoner’s design since its inception in the late 1950s (making the Modern part of Mossberg Modern Rifle seem a bit out of place). Mossberg seems to have also opted for an interesting choice with their non-chrome lined barrels in choosing an across-the-board button-rifled 1:9 twist, especially for a company working on marketing a sizeable share of the MMR line as hunting rifles. A faster twist of the barrel’s rifling (i.e. lower second number) allows a heavier bullet to be stabilized. The old 1:12 twist barrels were fine for 55gr projectiles, but the heavier 62gr projectiles needed this 1:9 twist to properly stabilize and produce consistent shots. As far as hunting ammunition goes, there is a lot to choose from in the 60-65gr range but a 1:9 twist will have a difficult time stabilizing heavier 70-75gr projectiles that some hunters may wish to opt for. Perhaps Mossberg will offer a 1:7 twist barrel as an option in the future. On Tactical models, these barrels are topped off with removable A2style muzzlebreak while the Hunter models feature a plain profile with no muzzle devices (or threading to add a muzzle device, for that matter). Despite the age of the AR-15 platform itself, the Mossberg MMR line of rifles does offer some welcome updates to the original design. The MMR’s carbon steel barrel is free floating in all models, regardless of whether you choose the Hunter model with the slender tubular fore-end or the Tactical model with the Picatinny quad-rail fore-end which extends the Picatinny rail atop the upper receiver on all models. The checkered aluminum fore-end of the Hunter models also features dual swivel studs, which allows for use of both a sling and a swivel stud mounted bi-pod. The forward assist is absent on all models although the brass deflector remains present. Other updates that add to the general user-friendliness of the MMR include a Stark SE-1 pistol grip which provides both an oversized trigger guard and battery storage compartment in addition to a comfortable hand-hold. The oversized trigger guard is a nice touch which allows for use of the rifle while wearing gloves, which is often the case in both hunting and tactical environments. The oversized charging handle feels solid and is easy to access and manipulate from both the right- and left-handed shooting positions. Despite these user-friendly features, I found the controls to be a bit stiff, requiring more force than I would expect to manipulate the selector switch, charging handle, etc. In addition to the fore-end and muzzle device differences, there are also several other differences between the MMR Hunter and Tactical models. Hunter models are available in two Mossy Oak finishes, Treestand and Brush, in addition to the phosphate/anodized finish which graces all Tactical models. In the stock department, the Tactical models are available with adjustable 6-position or fixed length stocks while the Hunter models come only with synthetic A2-style stocks with no adjustment for length of pull. 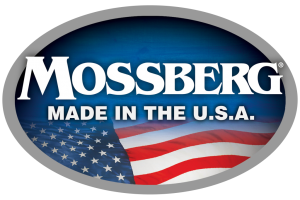 In sum, although not a revolutionary product, Mossberg’s foray into the AR-15 market seems to be a worthwhile one. The MMR line of rifles appears to be of high quality and they are comfortable and easy to handle. With price tags in the $920 to $1000+ range, the MMR line may be pricier than what one could build a bare-bones rifle for but competitive with other entry level rifles with fewer features. Hi, wonderful article. I must say that people are looking for new modes in ar 15 lower receiver, do you think that people going to notice these tiny details shown in here. I think that the type of people who would notice or appreciate the minor differences between the stock lower receiver on the MMR vs one on other run-of-the-mill AR15 style rifles is also the type of person who would recognize that that run-of-the-mill lower could be spruced up with those same features using parts from a catalog or website for much less. Most other manufacturers also offer these features as add-on options when you buy a rifle and many of them have years and years of AR15 experience behind them. Thanks to share this all information here…..